Crumble Oreos; set aside. Fold together the remaining ingredients. 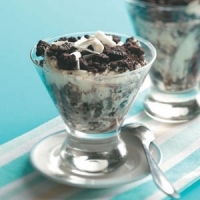 Layer as follows: pudding, Oreos, pudding, Oreos, etc., for a total of 4 or 5 layers. End with one inch of Oreos on top. 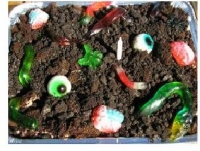 (These may be ground fine in a blender so as to resemble dirt.) 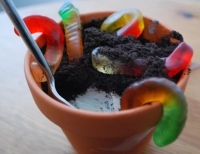 Optional: Add gummy worms to layers.